There are many traders performing stock trade online every single day. Most of them do not finish well as it is known that only 5% traders are profitable. And you want to be member of this group of winning traders. It is not complicated. Profitable traders have something in common. They follow very well defined rules. They have rules for almost every part of their daily trading activities. One of very important part of any stock trader’s day is pre-market time before the markets open. What do you do in this time? It is crucial to have defined steps for this part of the day. Steps that will prepare you for stock online trade the best way. What does “pre trading routine” mean? Well, making money in any stock trade online is not only about placement of orders, entering and exiting the trades. There are many more everyday action rules in every system. Rules for actions you have to perform before markets are open. The first activity you have to do is to analyze the general market situation. The best way is to use daily and weekly charts of the Nasdaq Index and S&P500 index. It is also possible to use index ETF shares that track these major indexes to analyze the overall situation. This analysis helps to determine what type of strategies you should prefer. If there is a bullish situation or bearish situation in the market. Analyze your actually open positions. Decide if you should use some of trade management techniques like moving of stop loss level or you can decide to take some profits during regular trading hours after the open. The third step is to look for a new trade opportunity that can be found in the market. It is possible to go through a list of ETF shares you already monitor. 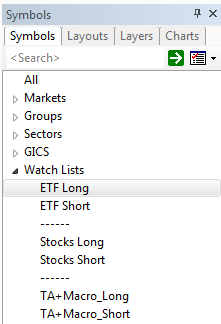 You can go through all of them or only check a list of ETFs you selected into a short list of most bullish ETFs or most bearish ETFs. 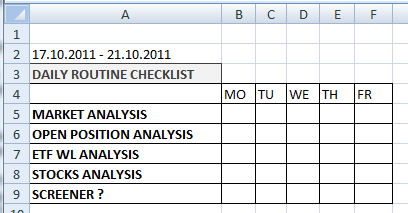 The best way to prepare such a list is to do a weekend analysis routine. The next step to do is go through a short list of stocks you monitor for possible long (bullish) trade or stocks for short sell (bearish) trades. It is good to put tickers into these two watch lists every time you find some candidate during every-day analysis routine or during a weekend analysis. You can also run some screeners to generate list of possible trading candidates for further evaluation. The best way is to use some checklist and use it as a toll to perform all actions every day. Here is an Excel example of my personal check list that contains all activities for pre-trade analysis. I check every point when it is finished. It helps me do my routine, as I see what should I do and what step must be accomplished. You can print this checklist and check it every day when you do pre trading preparation routine. It is a really good tool to improve the discipline.